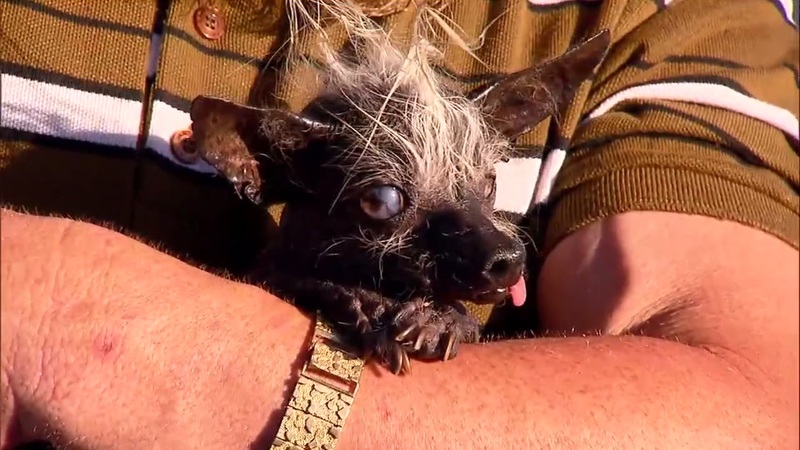 PETALUMA, Calif. -- A 17-year-old Chinese Crested Chihuahua with legs bowed out like a frog and an oozing sore is the winner of this year's World's Ugliest Dog contest. SweePee Rambo took home the title at the annual Petaluma World's Ugliest Dog contest Friday night at the Sonoma-Marin Fairgrounds after besting 15 other malformed pooches, The Santa Rosa Press Democrat reported Saturday. Judges in the contest, now on its 28th year, take into account bad appearance, including stench, poor complexion and a host of other inherited and acquired maladies. SweePee has a mohawk that glistens in the sun and a tongue that sticks out. She is blind in both eyes and has to wear doggie diapers. Owner Jason Wurtz, 44, of Encino, said he got the dog as a gift for his first wife but after a week she didn't want anything to do with the gremlin-like pooch. Wurtz, however, said he couldn't bear to let her go, calling her a "ride or die chick" in the description he wrote for the contest. When the 4-pound Chinese Crested Chihuahua mix was announced the winner, Wurtz's younger brother, Jeffrey Wurtz, burst into tears, shouting SweePee's name, and shaking a homemade sign that read "SweePee Rambo for President 2016." The presidential election was a theme present in the contest. One pup named Himisaboo, who didn't place, had a flowing golden tuft that resembled that of the presumptive Republican nominee for president. "Whether you love him, or loathe him, a vote for Himisaboo is a vote for a dog that looks like Donald Trump," said Heather Wilson, Himisaboo's owner, who drove out from Idaho for the occasion. Jason Wurtz and SweePee took the first-place title and trophy and a prize of $1,500. He says he will use the money to pay for the removal of a tumor that recently popped up on SweePee's gum line.